The Panama Canal was a major engineering and technological achievement. Its construction and operation were essential to the United States leadership role in the twentieth century. However, a major accomplishment of the project was uniting people from all over the world, and the organization of such a diverse workforce was, perhaps, the greatest challenge. Construction Crews in a Lock Chamber of the Panama Canal. 1913. Gelatin silver print. 2011.999.248 Panama Canal Museum Collection, George A. Smathers Libraries. Gift of Curtis Bliss. The construction of the Panama Canal required the skilled and unskilled labor of thousands of workers. Skilled workers came mainly from the United States, whereas unskilled labor came mostly from the Caribbean, but also from Europe, Asia, and Latin America. The small island of Barbados provided much of the unskilled labor, but Antigua, Grenada, St. Kitts, Martinique, and Guadaloupe. Errors on Rolls. 1915. 2000.029.126 Panama Canal Museum Collection, George A. Smathers Libraries. Gift of Ted and Patsy Norris. This document was prepared to evaluate the accuracy of different clerks in the payroll office. The handwritten comments explain that, from the clerks’ point of view, keeping the silver roll was a relatively easy job, since there were no benefits to be calculated and little variation in hourly wage. Gold Roll Records (left). 1947-1948. Silver Roll Records (right). 1944-1946. 2001.017.002 and 2001.017.004 Panama Canal Museum Collection, George A. Smathers Libraries. Gift of Burt and Carol Mead. a U.S. firm built the Panama Railroad in the 1850s. During the construction of the Panama Canal, the scheme evolved into a system of segregation whose purpose was the efficient control of the heterogeneous groups that participated in the project. 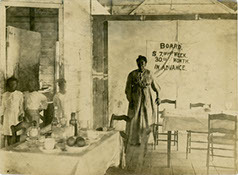 Interior view of restaurant showing proprietress. Gelatin silver print. 3.5 in. x 4.5 in. 2003.017.030.002 Panama Canal Museum Collection, George A. Smathers Libraries. Gift of Patricia Hall. While American workers lived in more comfortable settlements, West Indian employees lived in labor camps. The food they received in ICC cafeterias was often unappetizing and eaten standing up. For this reason, many West Indians preferred to find their own food and accommodations. This benefitted West Indian women who opened their own businesses to meet those needs. New Gold Commissary, Gatun, C.Z. 1943. Gelatin silver print. 2014.52.1 Panama Canal Museum Collection, George A. Smathers Libraries. One of the challenges American women in the Zone faced was to cook with native ingredients. The commissary offered the option of finding familiar items. San Blas Indians visit Miraflores Locks, Canal Zone. 1955. Gelatin silver print. 2003.052.056.003 Panama Canal Museum Collection, George A. Smathers Libraries. Gift of the Family of George & Mayno Walker. Pollera and Montuno Dancers. Gelatin silver print. 2001.077.006.001 Panama Canal Museum Collection, George A. Smathers Libraries. Gift of Dorothy Hart Holder. In colonial times, African women in Panama tried to recreate the dresses that the Spanish women wore. The result was the pollera, which consists of a white blouse with two pompoms and an ample skirt. Both are elaborately embroidered. Letter from Joe Wood. 1979. 2013.25.1 Panama Canal Museum Collection, George A. Smathers Libraries. Gift of Joseph Wood. 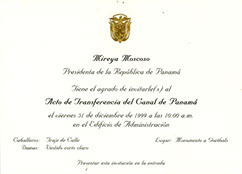 Invitación al Acto de Transferencia del Canal de Panamá. 1999. 2002.010.007 Panama Canal Museum Collection, George A. Smathers Libraries. Gift of Charles Hummer. 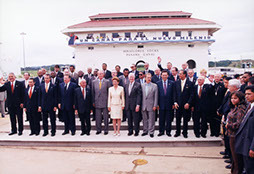 Before the actual transfer of the Panama Canal on December 31, on December 14, 1999, Panamanian President Mireya Moscoso, former U.S. President Jimmy Carter, King Juan Carlos I of Spain, and other heads of state participated in a symbolic and moving ceremony of transfer. Dignitaries at Miraflores Locks during Ceremonial Transfer. 1999. Dye coupler print. 4 in. x 6 in. 2014.52.1 Panama Canal Museum Collection, George A. Smathers Libraries. Gift of Joseph Wood.